The original eye scanners inside the Centurion helmets consist of 32 tightly-positioned small light bulbs - not LEDs. The first one lights, going over to the second one and finally the third bulb. As the fourth one powers up the first one fades out. As the fifth one powers up the second one fades out. This gives an animated trailing effect. The eye ran on split voltage, 16.8 to the lamps, 8.4 to the circuit. The circuit had an on-board voltage regulator. The original eye scanners also didn’t have an off-switch. If they weren’t needed during breaks, it was simply disconnected from the power supply (the battery belt). 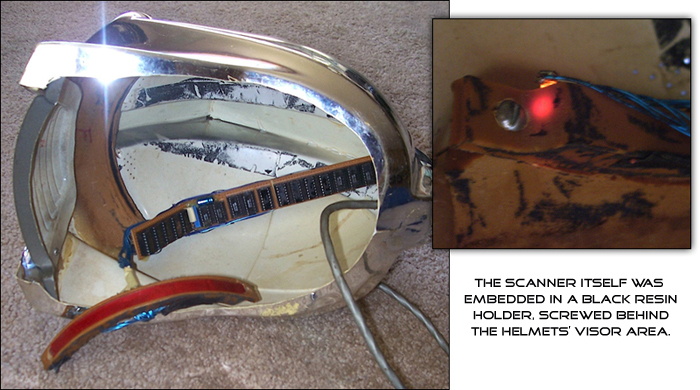 The scanner itself was embedded in a black resin holder, screwed behind the helmets’ visor area. For special shots requiring a stopping/fading eye (like Red Eye in his final moments in “The Lost Warrior” or Cy coming to life and death in “The Return of Starbuck”), there was a modified circuit using a switch to have the eye movement to stop where it is, then, the power was pulled and it faded to black. The positive power to the lamps was intermittently interrupted and connected to get the effect. There are a few newly constructed faithful-to-the-original bulb scanners on the market from time-to-time. 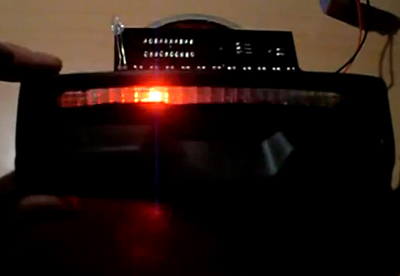 However, most modern day replica Centurion eyes utilize LEDs and various fan made circuit designs. LEDs burn longer, brighter, cooler, and consume much less power than the original bulb setup. LED counts, styles and construction vary widely in replica eyes. Cost can be very low to very high depending on the components and features included. It is most common for the circuitry size to be designed to fit into the narrow hollow Mohawk area. Also a typical is a 9 volt power supply stowed in the helmet as well. Gone is the need for power supplied from the battery belt. 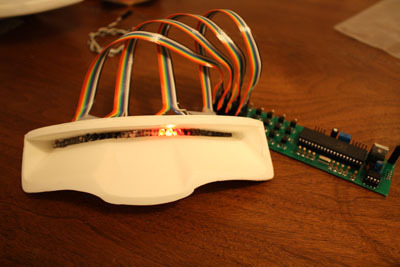 Below are a few examples of LED eyes.